Description: Succulent plants with spreading stems, flowers in leafy clusters with shiny petals generally 5, 4–15 mm, stamens 3–15 and two sepals. Notes: Common in the upper Sonora Desert especially in Arizona after an abundant rainfall where half the population may be white. 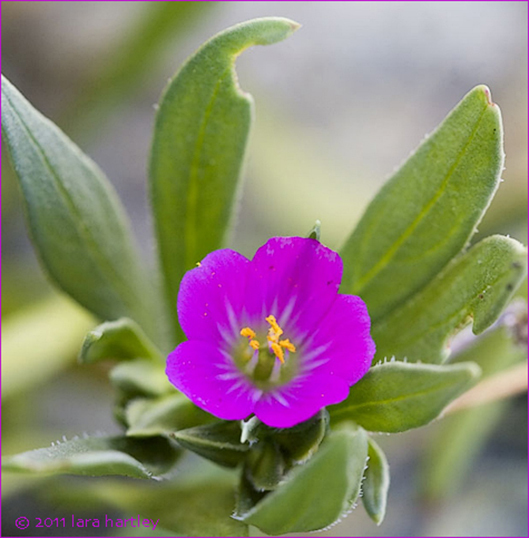 The Calandrinia genus was named after J.L. Calandrini, Switzerland, born 1703. This is a hardy plant well adapted to many habitat and climate types which is also known as a minor weed. Horticulture information: Given full or nearly full sun (tolerates summer afternoon sun), grows especially well in zones 7, 8, 9, 14, 15, 16, 17, 18, 19, 20, 21, 22, 23, and 24 and also in zones 4, 5, and 6. Given moderate summer watering, and full or nearly full sun (tolerates summer afternoon sun), grows especially well in zones 10, 11, and 12 and also in zones 1, 2, 3, and 13.